The Legal Genealogist is headed to Iowa later this week for the Iowa Genealogical Society‘s Annual Fall Conference. On Friday and Saturday, October 20-21, at the Toad Valley Golf Course in Pleasant Hill, we’re going to talk about researching those hard-to-find women in our families, about figuring out clues from the ages people had to be, about copyright and using court records and legal lingo and those wonderful scoundrels in our families. And we’re going to hear about homesteaders and their records from Robert Marcell and what’s new at the State Historical Society of Iowa & Archives from Shari Stelling. It’s going to be a great conference. And it creates a real problem for this East Coast resident. I mean, do you know how to pronounce the county in Iowa where my third great grandparents lived? And — because I spent summers as a kid on a farm in Virginia where the nearest town was Louisa (Loo-EE-zuh) — every time I try to say it, I get it wrong. Because it’s not pronounced that way in Iowa. The city of Madrid in Boone County is not pronounced like the city in Spain. It’s not muh-DRID. It’s MAH-drid. And the county seat of Story County, Iowa, may be spelled like the state Nevada… but it’s not pronounced that way. So… if we’re researching our ancestors there, how do we figure out how to pronounce the places where they lived the way they did… and the way the locals do? 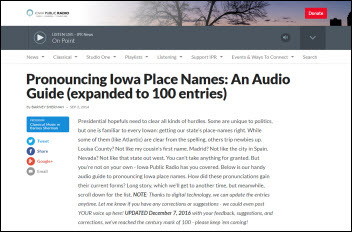 We trot ourselves over to the wonderful website of Iowa Public Radio and check out its feature called “Pronouncing Iowa Place Names: An Audio Guide (expanded to 100 entries)”… and we listen in. That’s where we can find out, quickly and easily, that Amish, Iowa, isn’t AH-mish. It’s AY-mish. And Camanche isn’t Cuh-MAN-chee. It’s Cuh-MAANCH. And East Peru doesn’t sound anything like the country in South America. In Iowa, it’s PEE-roo. Are you going to attempt any of the river names? Or any of the county names that are Indian names? That’s how we know the natives;-) And woe to the new news person or weather forecaster. It’s hard to watch them stumble and fall. I did know about Nevada – my ancestors are from Story and Marion counties, primarily. It created all kinds of fun pronunciation issues among my cousins when my family actually lived in the state of Nevada. In southern Illinois is a county seat named “Vienna” which is properly pronounced VY-enna. Turns out not to be a mangling of the name of the famous city in Austria but rather the name of the beloved daughter of the town’s founder. Teheran IL is properly pronounced Tuh-HAIR-uhn. Always has been, that’s not a recent change in response to overseas events. Hmmm… I see a Y in “Puyallup”, and I don’t hear it when residents say it. So I’d have to dissent from the “as it’s spelled” rule. Google maps had a hard time with Ottumwa and Wapello last weekend. Google kept saying AUTUMN-wa instead of a-TUM-wa. And wa-PELLO instead of WA-pello. Gave us a laugh every time. Also, Sigourney is SI-gurney not si-GOR-ney like the actress. I’ve heard people not know how to say Des Moines.